It's taken me forever to finish this mask partly because I've been working on several at the same time and also because I was very particular about the sculpting process. I also had to go through ordering a new Dremel after trying to find a replacement battery charger for a week or so! For better or worse. it's finished now! I don't have as many pictures as I'd like to have, but I can explain through the rest of the process. I ended up covering the mask with modeling paste to smooth it out a bit more, and then painted a couple layers of white gesso on as well. Once all was dry I sanded it (with fine paper) and started painting in my actual colors. It was funny to use painting techniques I would usually use on a canvas, on a 3d surface! I had already decided to make this mask more like that of worn copper. I wanted it to be very metallic as well. I mixed several colors for the facial part of the mask,and used a metallic gold/ brown color for the horns. Once these layers were set, I went in and added my shading which I used dark brown for on both accounts. 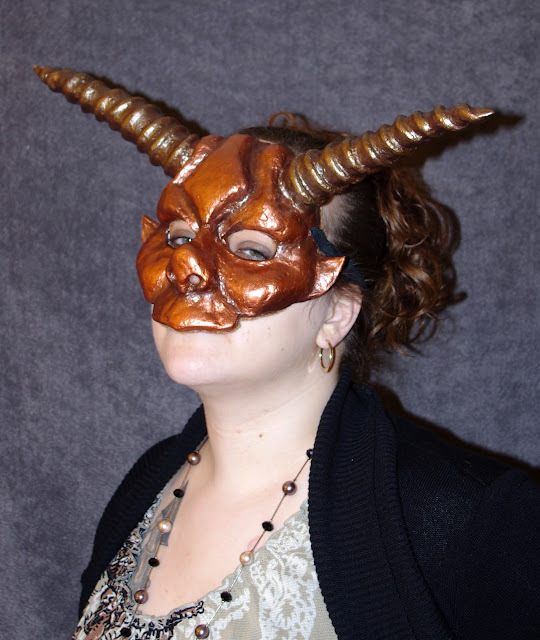 In the below picture, you can see the difference in the horns, where the right horn has been shaded with dark brown while the other is still that bright gold color. Once all of the coloring had been completed, I painted on a layer of matt varnish. And finally I found out why you have to wait 24 hours between layers or even before trying to do any work with it. Varnish takes forever to dry! And it's awfully sticky stuff! I was trying to do too many things at once because I was in a rush to get this blog post up after being sick, but I soon found that I couldn't rush it as this varnish even after 3 hours was still sticking to everything. So make sure you let your varnish dry! For future reference, I may just invest in some clear coats of acrylic paint so that I don't have to use varnish anymore for finishes. Once the varnish finally did dry, I was able to attach some nose pads along with the felt lining and the elastic headband. You quite literally have to do this all at the same time and it can be a pain. When all is said and done, I really like the way this mask turned out. 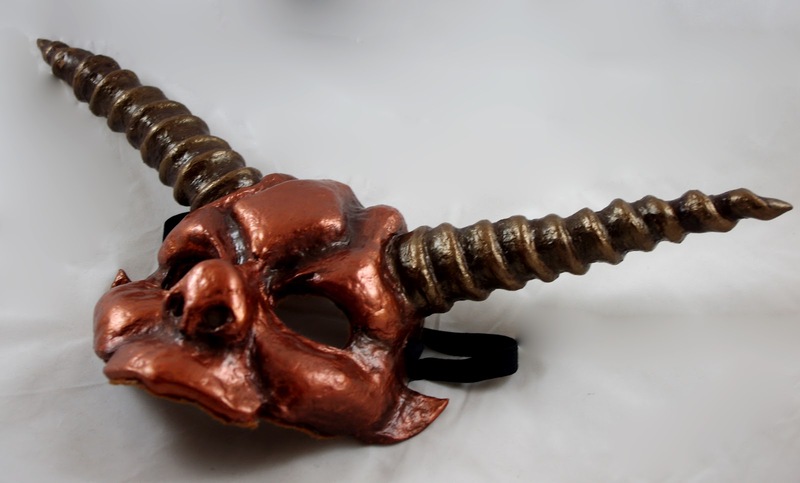 It has a personality of it's own which is what I like to go for with inspired masks. Not necessarily a direct copy, but a close brother of the Goblin King. Hey. You're mask looked awesome. Me and my sister had the same idea for a masquerade I was going to, tooks us on and off 4 weeks to put it all together (with a lot of blood sweat and tears!) This blog was quite helpful throughout! Wow it came out really good!